We know of three bells that were donated by A'Bear ancestors. Today sadly only one is known to still exist, namely the 1681 Sanctus Bell at Waltham St Lawrence. 'In 1618 John ABear, already living at The Hill, gave a tenor bell to the church of Waltham St Lawrence of which he was a Churchwarden. 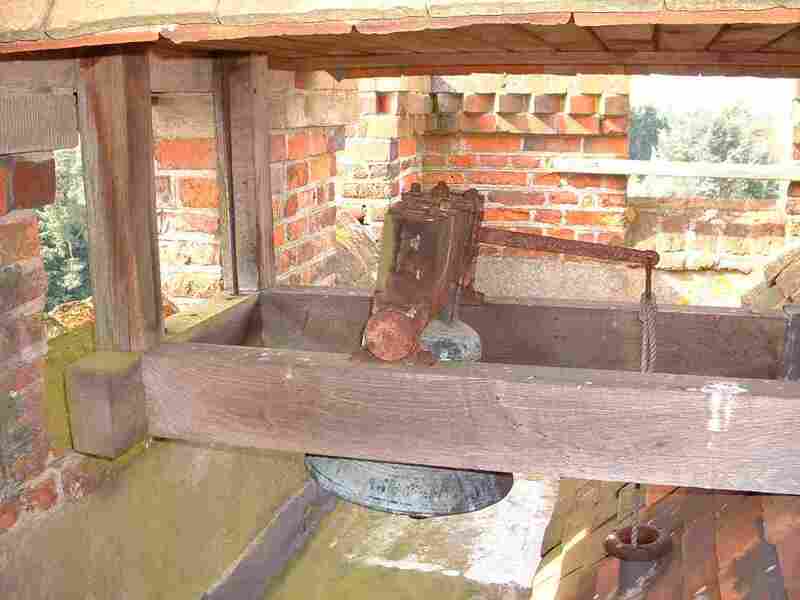 This bell was later used in the schoolhouse and was not one of those destroyed when Wargrave Church was burnt down in 1914. John A Beare / Abeare (1562  1639) gen 4W  of the Porch. John Abeere (c1600 - >1665) gen 5J  aged about 18 years in 1618. It seems unlikely that any of these Johns fit. The first was named John of the Porch, presumably to distinguish himself from John of The Hill. The second John asked in his will to be buried in the Parish Church of Wargrave suggesting an association with St Marys. The third John may not have been living locally at the time, and the fourth might be considered too young to hold such a post. 1618 pre-dates the building of the oldest part of Hill House, and no records have been found to date to suggest it was named as such by this time. Also, a study of the origin of the hill suggests it was located at this time nearer to Wargrave than the known site of Hill Farm, and therefore further away from Waltham St Lawrence. Taken together, the validity of the Popes statement is questionable. Adjacent to the church stands The Bell Inn, a pub perhaps named after one of the church bells. The Bell Inn was left to the parish by Queen Elizabeth I's publisher Ralph Newbery. It was a cottage at the time and probably became an inn not long afterwards. Ralph was a friend and neighbour of John A'Bear who died in 1616, father of John (1576  1647/8), and was one of those who drew up an inventory of his possessions after his death. So may have bought this bell in memory of his father and, since it was the main bell in the peel, agreed to name the inn accordingly. Alternatively, John of the Porch married Margery Newbery in 1633 who was probably Ralph's daughter or neice. This John was very friendly with Thomas Newbery, who was presumably closely related to Ralph, so there could also be a connection here. Returning to the validity of the year 1618, Pope makes no mention of the bell of 1681 in his book which was donated to the church at Waltham St Lawrence, and which still hangs there now. It seems credible that Pope stated incorrect information by writing 1618 instead of 1681, by referring to it as a tenor bell instead of a much smaller sanctus bell, and by misinterpreting the inscription on the bell which, it is true, was donated by a John ABear of the Hill, but does not name him as a churchwarden. In any case, a tenor bell of diameter about four feet might be considered a rather large object to move and hang in a schoolhouse. Whatever the truth, it is known that by 1659 three bells were broken including the tenor bell. [See next section.] These were recast in 1660, and it is not known whether the new tenor bell was ever engraved in keeping with the original. So if Pope was right and a bell was removed to the Waltham schoolhouse (perhaps in the 19th century) it would probably be of little interest to our family. This inscription is cast in relief in the orthodox manner and is formed in well proportioned fourteenth century lettering. lettering are not known to campanologists to occur elsewhere." This bell is still there and is still rung regularly. The bell was most likely donated by John (1634  1685) gen 6J. It does not seem from the inscription that John was necessarily a Churchwarden at the church, nor even a regular worshipper there, although his brother Francis was baptised at this church in 1646. In fact, seven years later in 1688 (after Johns death) another larger tenor bell was hung at St Marys Church with an inscription suggesting that Johns son John (c1654  1711) gen 7J was then a Churchwarden at St Marys, aged about 34 years. This might suggest a tradition of family attendance at St Marys Church. How John came by this sanctus bell is not known, but between 1668 and 1670 St Marys hung five new bells, and perhaps John later passed on this old bell to Waltham St Lawrence as it was surplus to their requirements. Alternatively, it is possible it was discovered near Hill Farm, for the 1818 Enclosure Awards names a nearby path Little Bell Lane, the origin of which is unknown. This track was then a cut-through between Scarletts Lane and Bath Road, abutting land named Five Acres which was a large field owned by the family in 1818 and, being so near to their house, quite probably farmed by them long before then. The name could, though, simply be a reference to wild flowers or have some other derivation. Nothing is known of Robert Conisbe. Mark A'Bear and myself visited the church in 2002 and climbed the tower with its difficult staircase and narrow access, and took photographs of the bell. A churchwarden is responsible for the upkeep of the bells and holds the keys to the tower; so he should be contacted in advance of a planned visit. It would seem that Hen Boult (or Henry Boult ?) may have been the churchwarden (CW) in 1681, but the vicar was unable to confirm this.
. 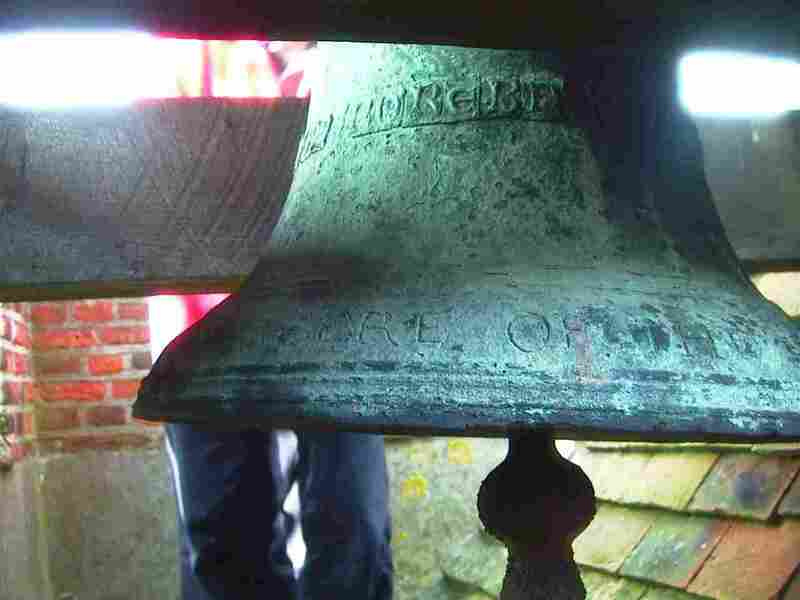 The charge of our bells in new metal and casting came to £130 by Rates and of free gifts. The Sanctus Bell, which hangs at the top of the tower, bears this inscription scratched around the lip: The gift of John Abeere of the Hill, 1681, and Hen Boult, X C.W. It was in this edifice, so rich with memories of the past, that the Rev. G. G. Wadsworth, LLD., the 36th of his line since the earliest records of incumbents can be traced in 1439, was on Saturday afternoon last inducted as Vicar by the Lord Bishop of Oxford, to whom the new incumbent was formally introduced by the Rev. Canon C. E. M. Fry (Rural Dean). It was a simple but impressive and memorable service, and the Bishop of Oxfords address was appropriate to the occasion and to the idea of present day religion. Footnote : G. G. Wadsworth was inducted in 1934, so this article must date from this year. The Victorian County History of Berkshire (1923) also mentions a plate at Waltham St Lawrence consisting of a paten of 1783 inscribed Beare to Waltham St Lawrence 1784. Enquiries through the church The Gift of Thomas have led to the description of a miniature cake stand, six inches in diameter and with a small pedestal foot, and the discovery that the inscribed surname DEANE, not BEARE. "SAMVELL KNIGHT MADE MEE HP W DEAREING JOHN ABEARE CW 1688." The Bells, made by Henry and Samuel Knight, Bell Founders of Reading, bear dates from 1668-1688; in the latter year, W.Dearing and John Abeare are noted as the Churchwardens. This bell (along with the other five dated 1668 and 1670) was destroyed in the disastrous arson attack of 1914. The leaflet produced at the time of this fire quotes the W DEAREING as " W DEVIENING ", but this is most likely a mistranscription. CW must surely stand for Churchwarden, and one thought was that HP may stand for High Priest. The Vicar at St Marys at this time is recorded in the church information leaflet as Wm Derham D.D. (or Dereham) (1682  1689). There is a similarity in names, but it is not thought that one is a misspelling of the other, as the vicars surname is confirmed as correct, as is the surname Dearing. William Dearing witnessed Jane Abeares will and wrote her inventory in 1678. Jane was the widow of Francis Abeare (1609  1677). Also, William Dearing wrote an inventory of possessions following the death of John Abeere in 1685. [This was the John who it is believed donated the 1681 Waltham bell]. Certainly there is a William Dearing or Deering recorded in the Parish Registers - Father of Grace (1700) and Francis (1703). Grace died in 1707 and William died in 1712. William is noted as Farmer or Labourer. Perhaps then the HP stands for Honorary Patron, or suchlike? Or maybe W Deareing and John Abeare were both Churchwardens, and HP should not be associated with the name that follows it. It seems the names of the Churchwardens are not recoverable. Until 1710, the name of only one Churchwarden is generally to be found at the foot of each page of the Registry, with that of the Vicar. In the early years of the 18th century, John James, and Richard Piggott, Robert and William Silver, Wm Dering, and ffrancis Wilks are known to be Churchwardens. Later, in 1720 Edwd Kitson and Wm Haycroft, in 1731 John Pickett Junr and John Smith and in 1756-60 John Mathews of the Court are named. So William Deareing was a Churchwarden, and still continued into the 18th Century. The named ancestor on this bell was evidently one of two people. It may have been the son of the supposed donator of the Waltham bell, namely John Abeare (c1654  1711) gen 7J. This man seems to have changed the spelling of his surname during his lifetime from Abeere to Abeare, so it does match that of the inscription. Alternatively, the other John living at the time was John Abeare (1631 - ?1702) gen 6W, son of Francis and Jane mentioned above.